Sold by Direct-From-Factory and Fulfilled by Amazon. Gift-wrap available. 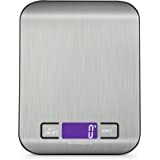 COMPLETE MEAL IN A BOX: Avoid the meals that just don’t fit in your muscle building diet. Instead take your wholesome meal with you while on the go. 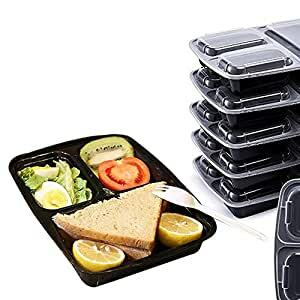 A practical solution to carry your food while at office, school, travelling or simply to have portioned and balanced meals. 3 SPACIOUS COMPARTMENTS: For those who prefer their meal to be neatly organized. 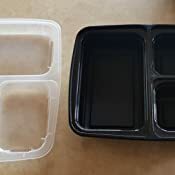 Portion bento box features three compartments because chicken, veggies and desert are better kept separately until they are eaten. Holds generous amount of food to fulfil your daily nutritional needs. Pack fruits, vegetables, nuts, dry snacks, main course, salad or desert for tackling a super busy day. 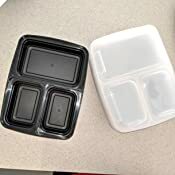 MICROWAVE, FREEZER & DISHWASHER SAFE: Store your food in freezer, reheat in microwave and wash the compartment meal container in dishwasher. As simple as that! 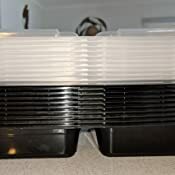 COMPACT, STACKABLE & LEAK PROOF: Stackable, compact and space saving design will easily fit in your freezer, lunch bag or purse. 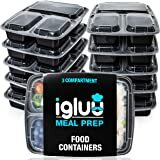 Plus three section meal prep container has a leak proof lid which closes snugly to avoid any embracing spills in your lunch hours. Can be easily opened using convenient flaps on the corners. Sold by Direct-From-Factory and ships from Amazon Fulfillment. Take your everyday soulful meal with you wherever you go. 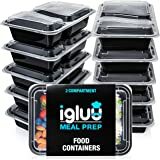 Meal prep just got a lot easier with this practical, user friendly and reusable container. 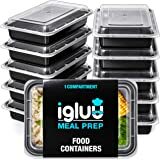 Whether you are a busy professional, working parent, gourmet cook, student or a health freak, our grab and go containers fulfil the required supply of portioned nutritious and healthy food while on the go. 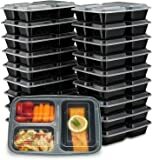 Designed for modern homes and lifestyles it brings flexibility, convenience, portability and organization to your everyday meal. 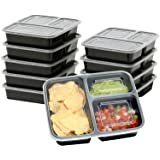 Made of strong and durable material it is safe to use in microwave, freezer and dishwasher. 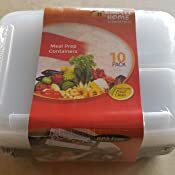 Additionally food container is robust enough for a long lasting use. 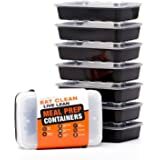 Food safe and toxin free material ensures that it won’t give your food a strange taste or smell and won’t release harmful chemicals when heated. Engineered to give you a fuss free and mess free serving experience, it features a leak-proof design to avoid spills.